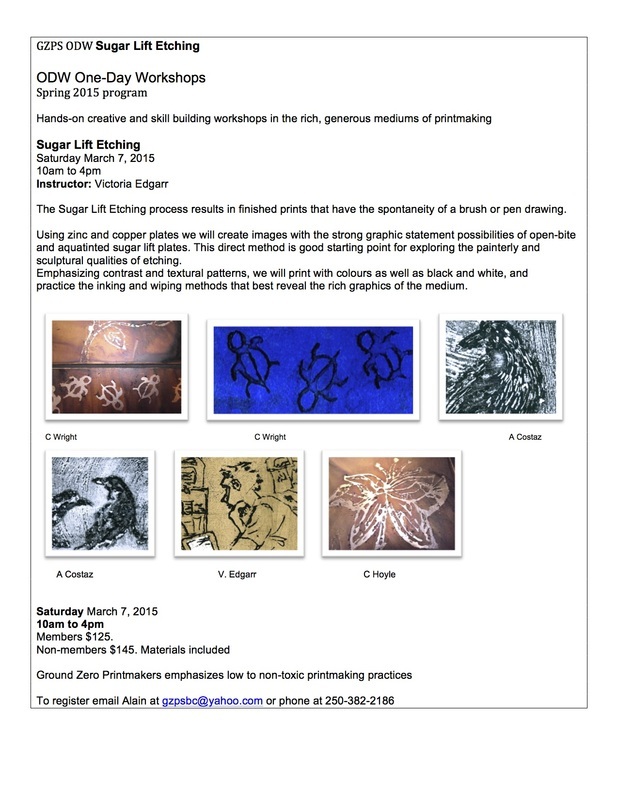 The Sugar Lift Etching process results in finished prints that have the spontaneity of a brush or pen drawing. 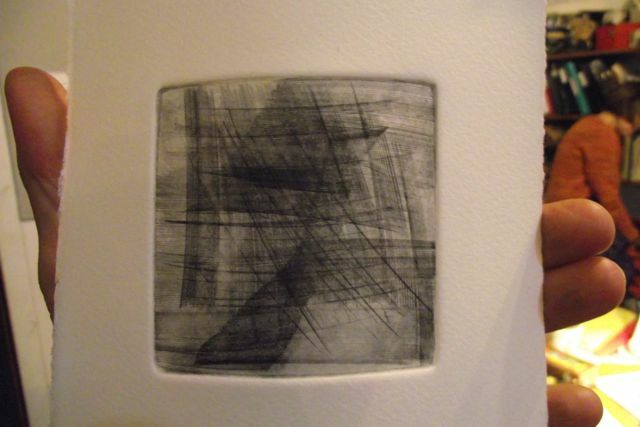 Cindy Wright is a printmaker and mixed media artist working in exploratory methods, looking for new processes and materials to incorporate into classic techniques. A biologist and a paddler, her love and knowledge of oceans is often reflected in her subject matter. Her visual arts education is a combination of self-taught and community-based programming, as well as learning from other artists. She has exhibited in many GZPS and Xchanges Gallery shows where she is an active studio participant ad board member. 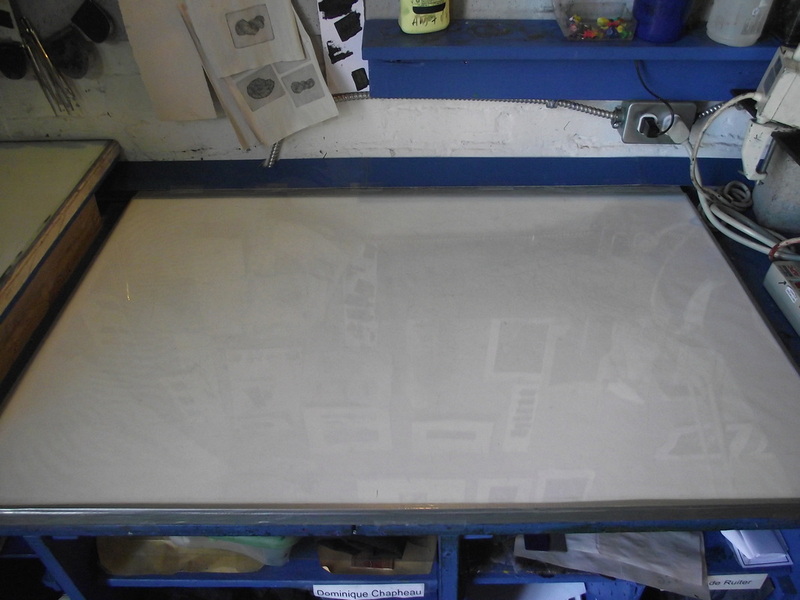 Monoprint Glazing / or tinting is a method of building up an image with thin 'clouds” of colour. In this workshop you can build mult-icolour images through colour glazing and layering, learning how to combine sharp delineations with soft transitions of colour to give shape and depth to your completed image. 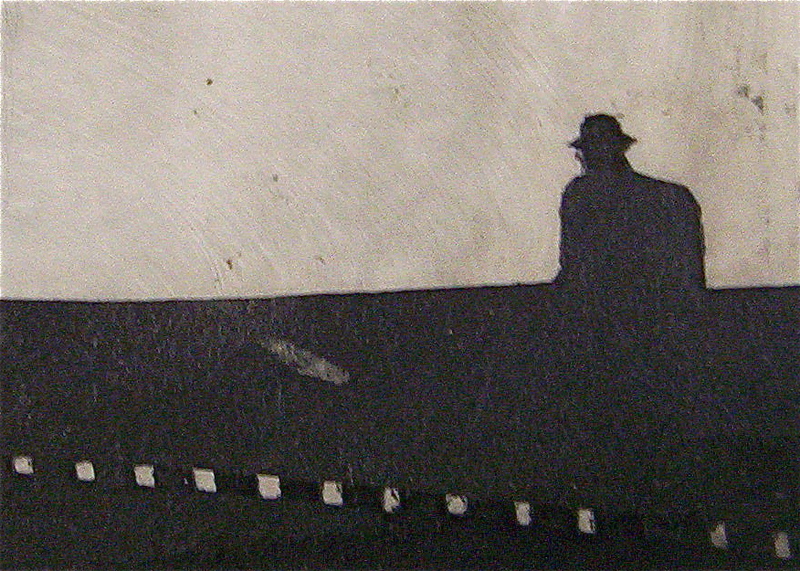 Monoprint Glazing can combine planned images with spontaneous exploration, giving your images a broad range of possibilities within the same technique. 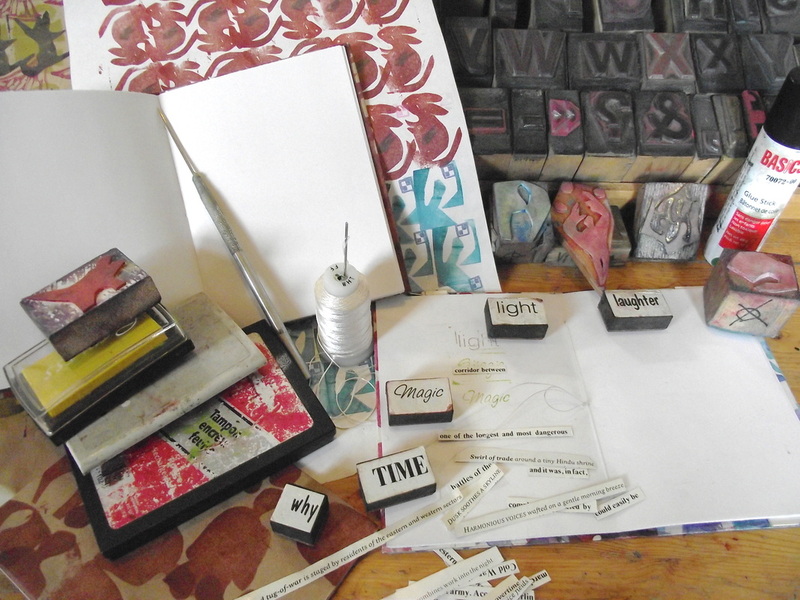 Create a word-based self-portrait with Ground Zero Printmakers. 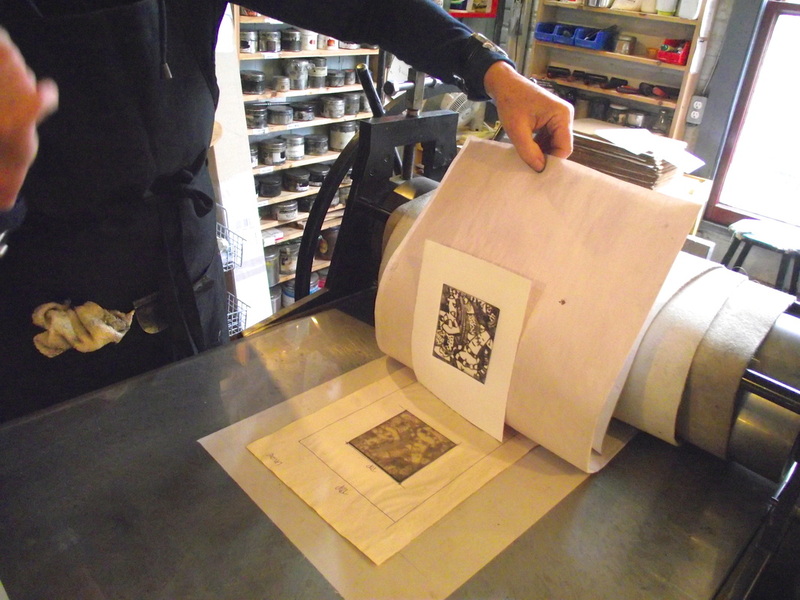 Make a hand-printed softcover booklet as your self-portrait using colours, letters, patterns and images transformed through printmaking. Materials supplied. Thanks to all the members who came out the the yearly meeting this last Tuesday. We had a great spread of food, wine and conversation! Congrats to Randi Feil, our newest board member, and to our returning board members Alain Costaz, Cindy Wright, Nancy Murphy, and Bev Peden. 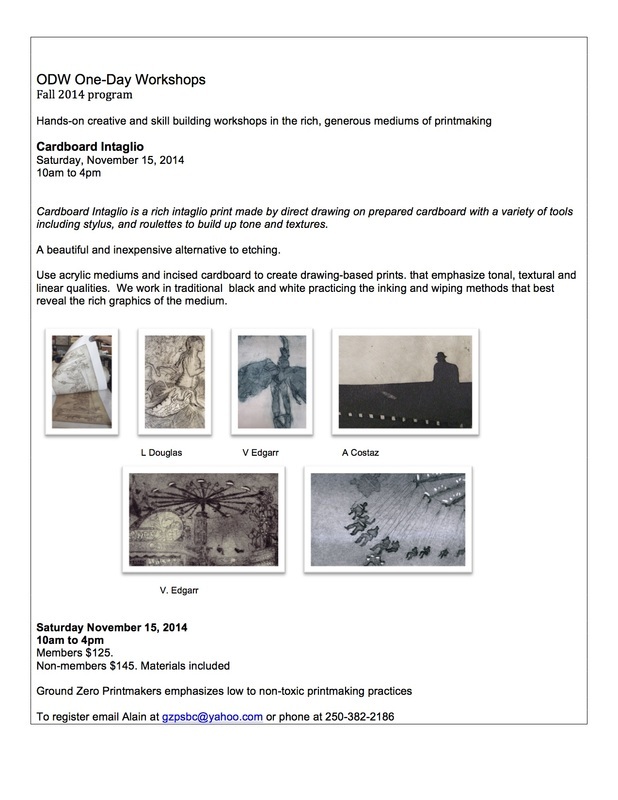 We are all looking forward to a new year of printmaking! 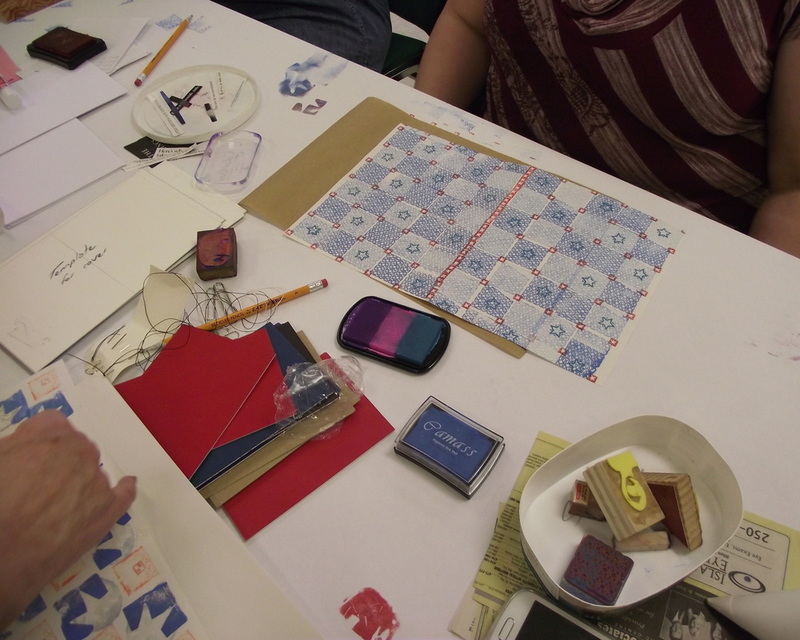 On Saturday, April 26th, Victoria Edgarr and Ground Zero Printmaking Members led a bookbinding workshop at the Nellie McClung Library. 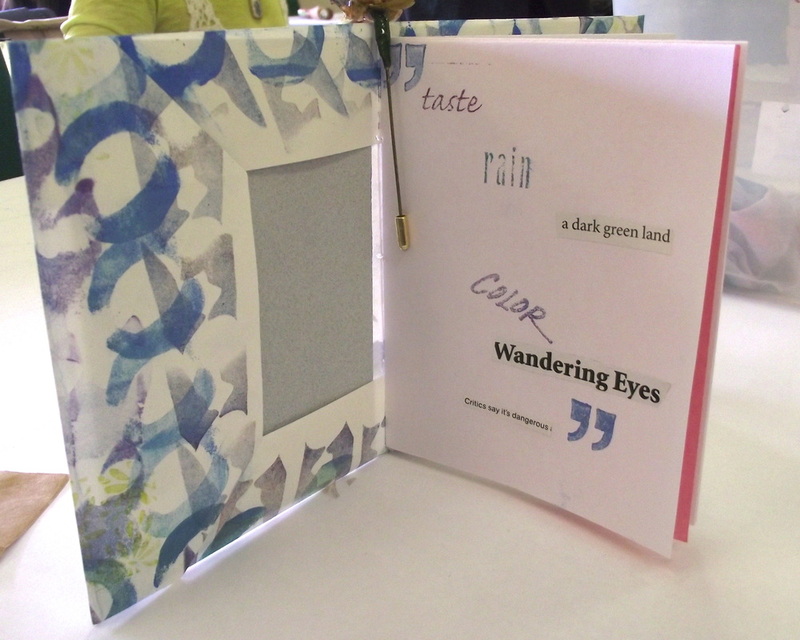 Participants made a hand printed soft cover booklet and created poetry with cutout words to paste inside. 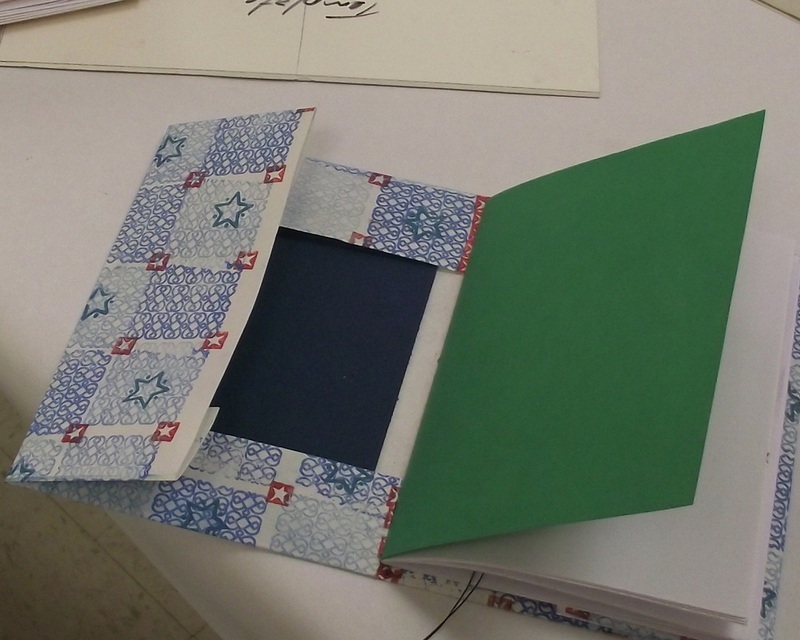 Covers were made with homemade stamps and were stitched to the book block. Everyone went away with some vibrant results and new skills. Thanks to Alain Costaz, Desiree deRuiter, Ellen Rooney, Trish Shwart, Susanne Underwood, Bonnie Farris, Jenn Nichols, and Avis Rasmussen for their involvement and assistance. Any members wanting to drop off prints for the archives or willing to help out with "end of the year" admin tasks are invited to come out next Friday during open studio time. We would welcome any help as we close off our printing studio year! 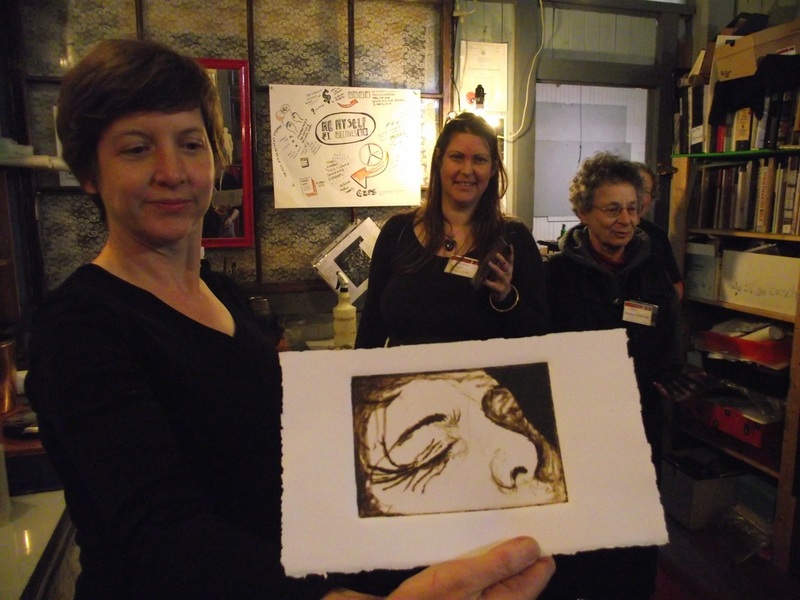 Last Tuesday night, members and non-members joined Artist Susan Underwood for a small workshop on multiple ways of photo transfers. 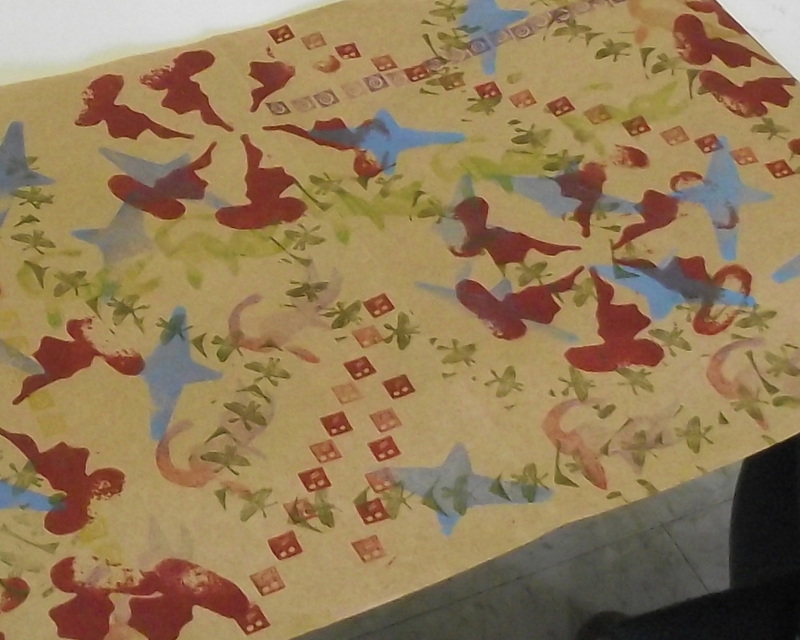 Participants used medium, blender pen, and packing tape on toner based photos to make collage images. Thanks to all the participants and especially to Susan for demonstrating this unique way of working. 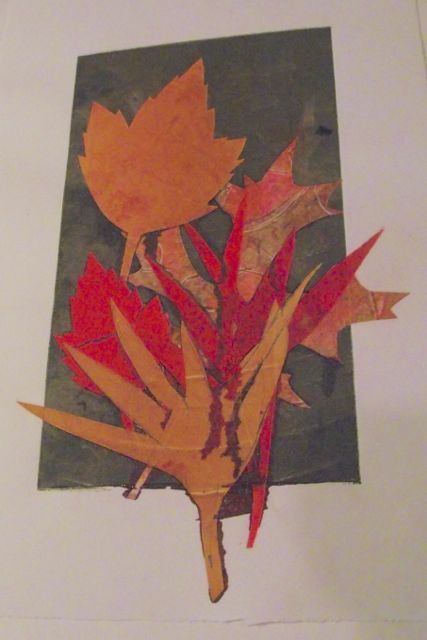 Susan, along with artist Lorraine Douglas, works at Cecelia Press. Thanks again! 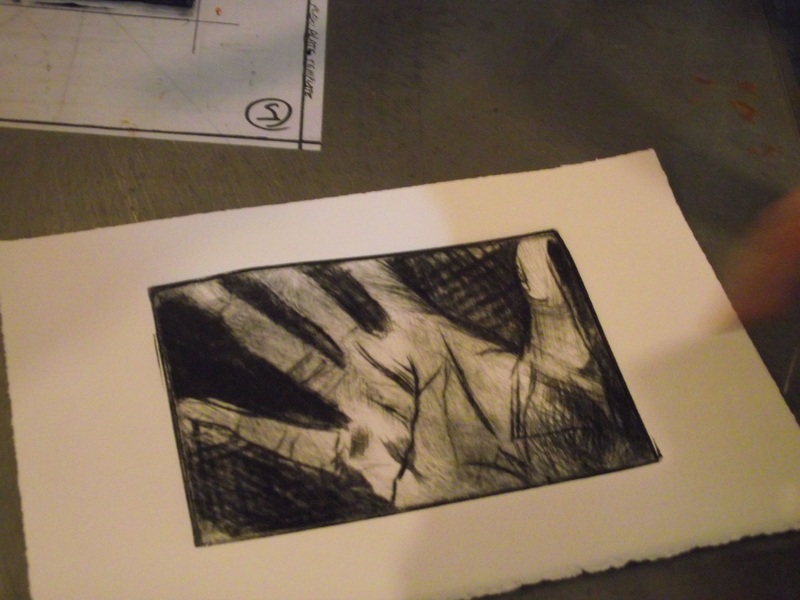 At last Saturday's workshop participants made dry point images with lexan and aluminum plates. Using scribes, roulettes and engraving tools artists made rich black and white images through drawing-based and painterly methods. 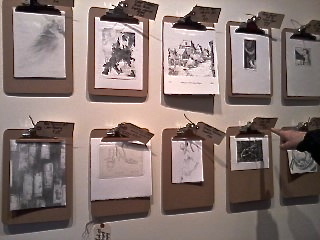 Everyone came away with three plates and some nice mini prints. Thanks to everyone who came out to our first Cleaning Day last Friday. The day was a success as we prepped supplies, cleaned the print space, sanded the press, and sorted a large donation of paper. On March 7th we plan to have an Archival Day, where interested members can help sort and update the print archives. 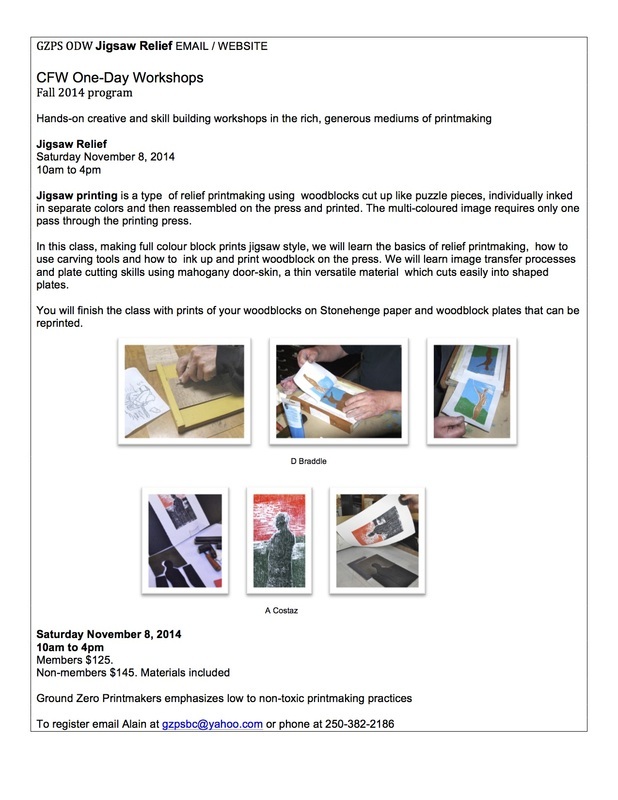 This will happen during open studio time, so feel free to print, sort, hang out or all of the above! Thank you to Lilly Wallace for a large donation of acid mat board and paper. All members are invited to take what they need, keeping in mind that most of the mat board is coloured. A number of Ground Zero members were included in the small works show in the Massey Gallery of the Art Gallery of Greater Victoria. The show runs from February 13th to March 3rd. Small works were hung from clipboards on the walls and extras were compiled in the next room. Most of the works were in black and white and showed the diversity of drawing. The show is coming down soon, so see it while you still can! 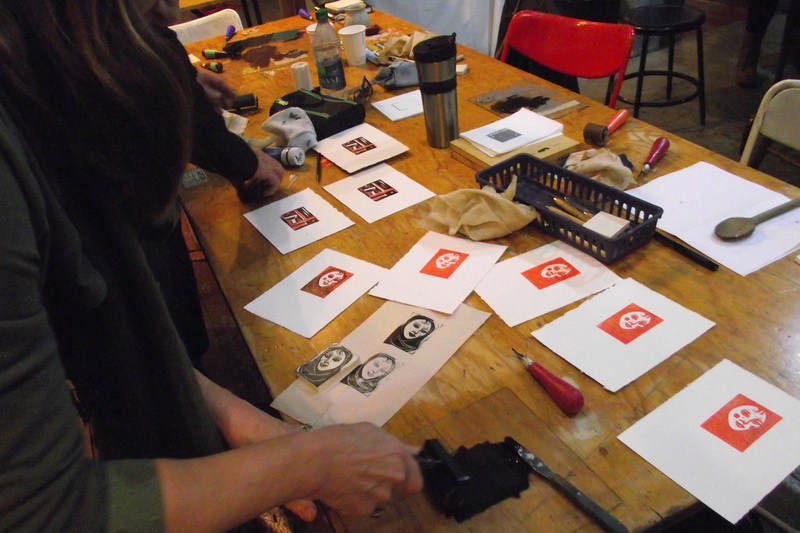 Artist Avis Rasmussen led participants in creating miniature prints of reduction lino cuts with great success! Everyone took home wonderful and diverse editions of colourful reductions. Lovely work everyone! Thanks to Avis and all the participants for coming out. Avis will be leading a relief reduction. More details to come. Looking forward to some group activity! Sherry Willing is curating a show for Art Rentals and Sales at AGGV. 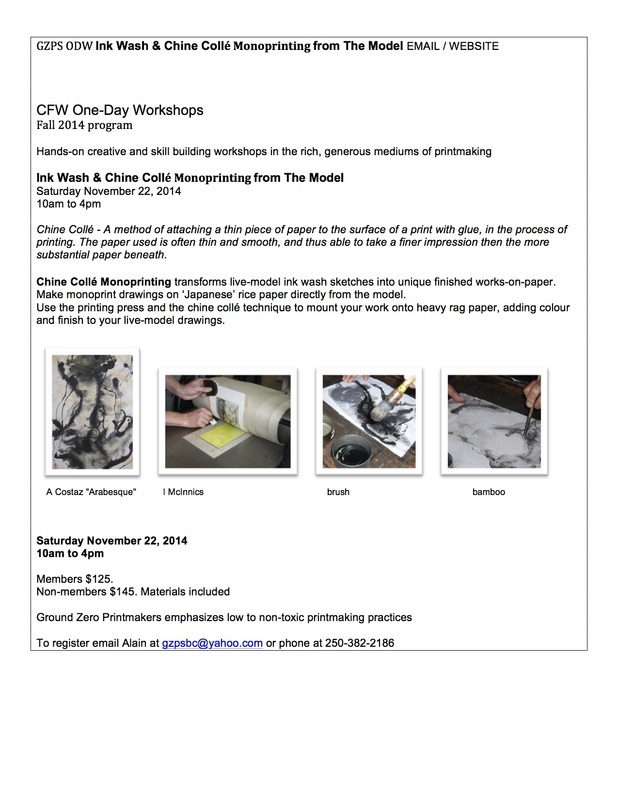 Calling artists for drawing and printmaking of small works on paper. Deadline Feb. 1st. Capital Iron stocks Loops for approx $10.00-$15.00. 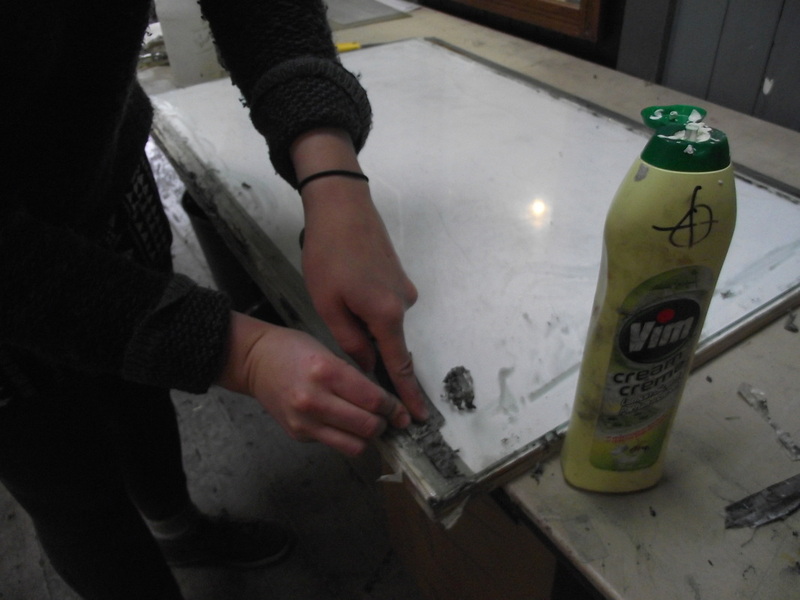 This is an indispensible etching tool. Get it now! Lastly, we have a freshly cleaned glass counter top as of today. Lets try and keep it clean and not scratch it up. 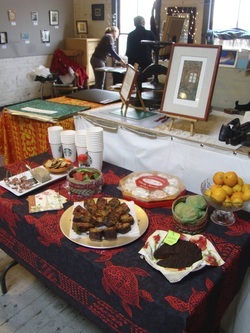 The Christmas Open House was held on December 14th and was a huge success. Thanks to all the artists who participated and also the people who came out to see the work and support the artists. 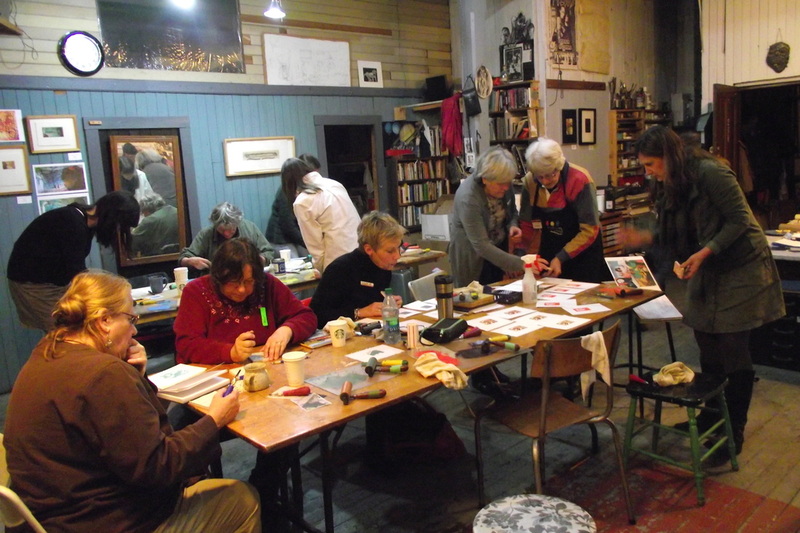 There was plenty of interest in the studio with inquiries into membership and workshops. Artwork was also purchased for individual collections and the newly organized Public Archive Portfolio was also on display for the first time. Lots of artwork is still on exhibition, so come and see our great selection of Mini Prints. Victoria and Desiree are sorting through the archives, creating a larger presentation portfolio. Each member should have their own page from which they can switch out prints, choosing which prints they would like to feature. This way visitors can find artists they like before finding more of their work in the larger archives. 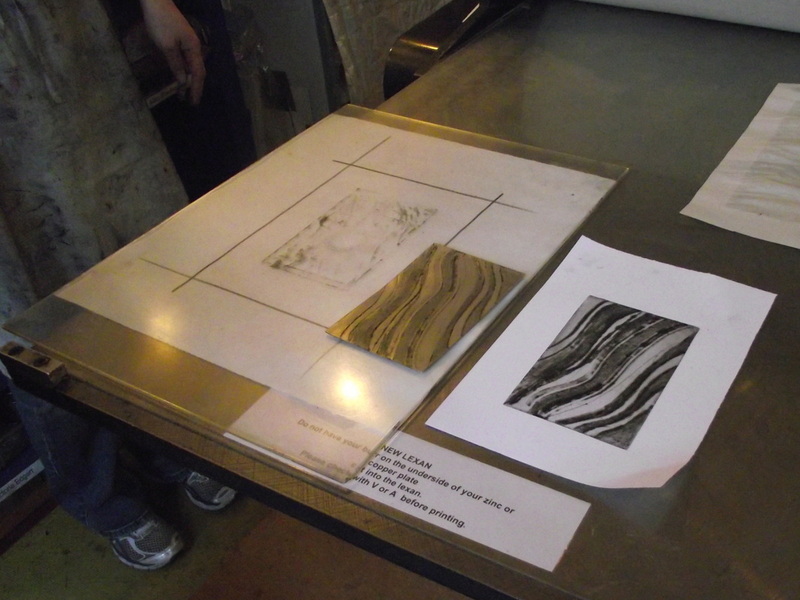 Please bring in any work printed in the studio that you would like to include in the archive. 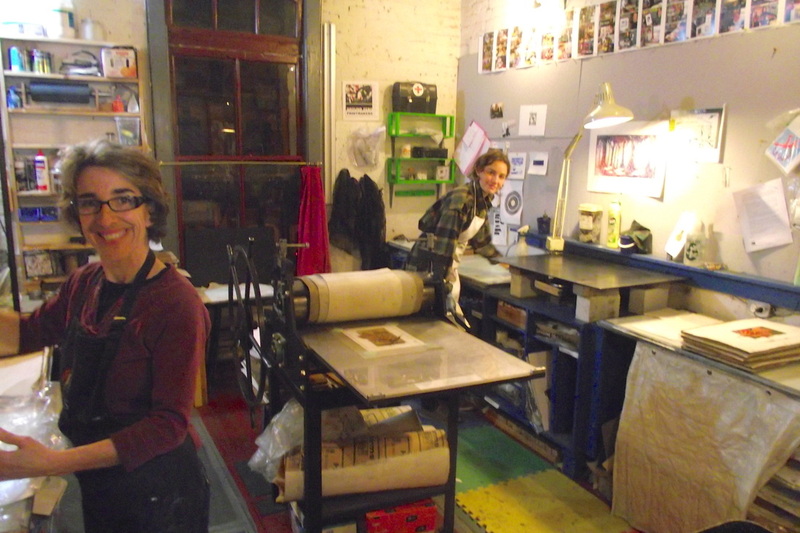 Today saw a full studio with four members printing: Dominique, Angela, Cindy and Martime. Please remember to bring in approximately 2 or 3 framed works by Friday December 13th. Also, send information of framed works to Cindy by December 11th. Portfolios are also welcome, just keep them at a minimal. A Proposal: Ground Zero Members will be making a group album of mini prints. For Cadaques plate must be no bigger than 3.9"x3.9"
For Bimpe plate must be smaller than 4"x6"
*Please double check sizes for your own reference. We are also contemplating a print exchange amount the Ground Zero Members. Contact Desiree. 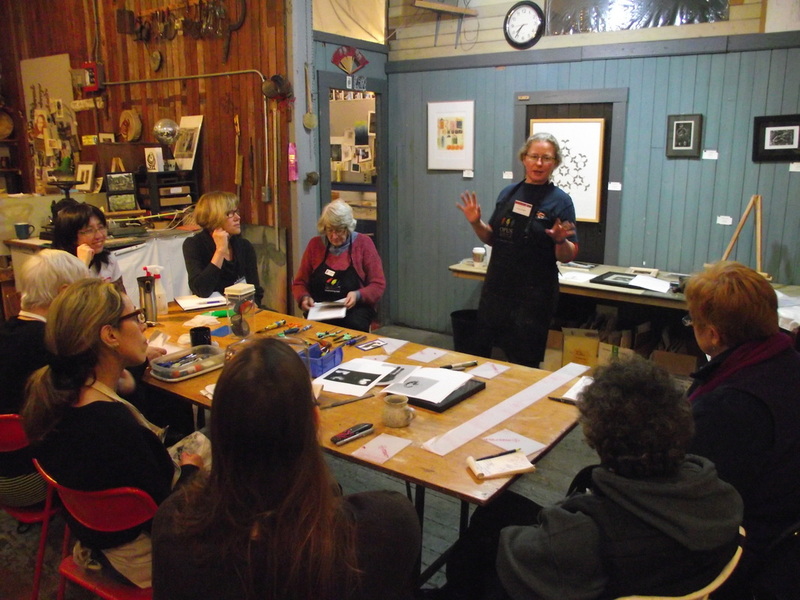 Tuesday's mini workshop was presented by Mezzotint Artist, Randie Feil. 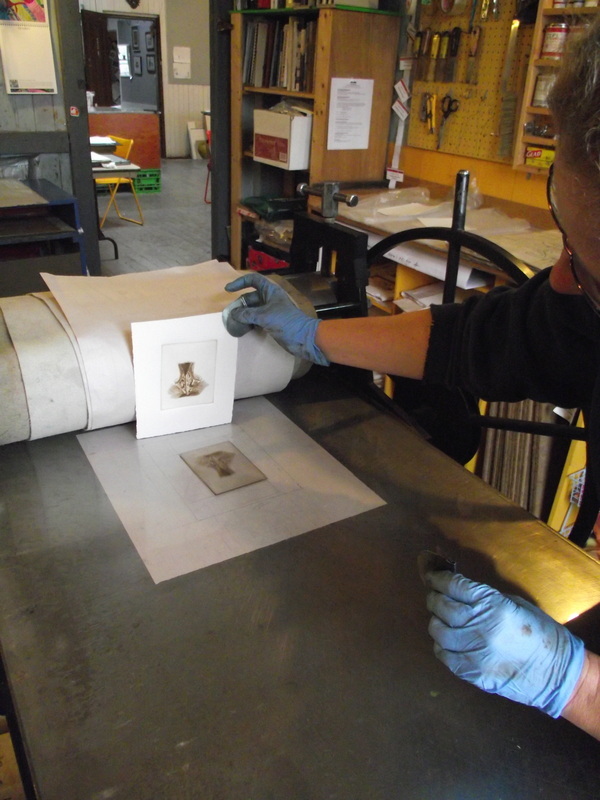 Randie holds a BFA in Printmaking (1990) from the University of Victoria and is a member of the International Mezzotint Society. The workshop was attended by fifteen gzsp members and non-members. 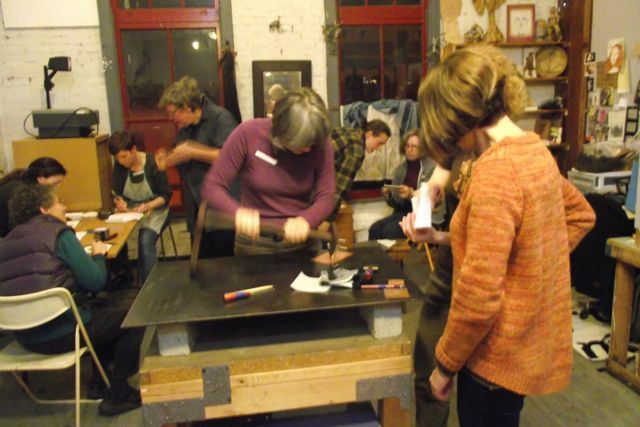 Participants used rockers, hand-rockers and other tools to prepare plates before burnishing, inking, and printing plates. 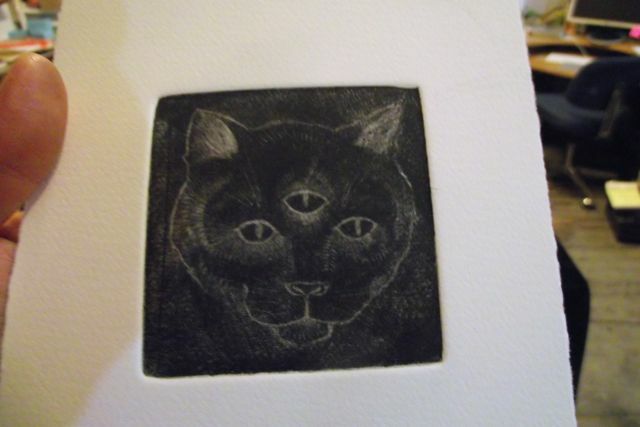 Everyone left with a personal mini mezzotint print. 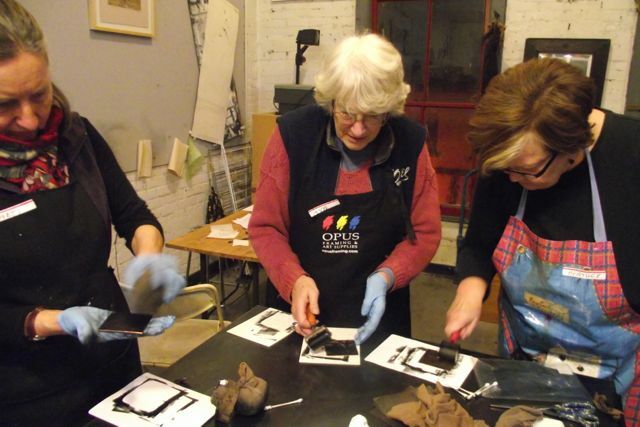 Thank you to our wonderful instructor Randie Feil for explaining the intricacies of Mezzotint. 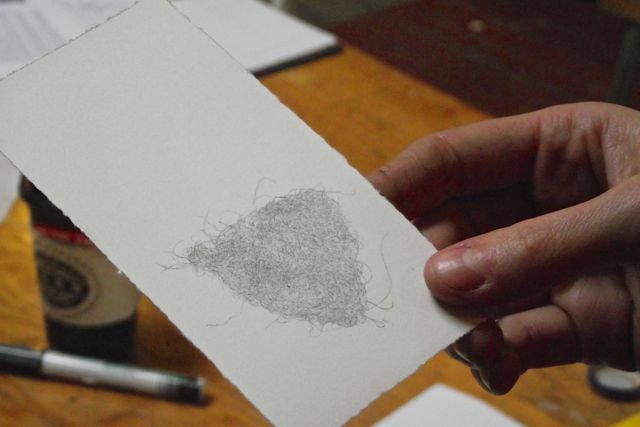 Artist Angela Snieder, developing monoprints by pressing hairy objects. 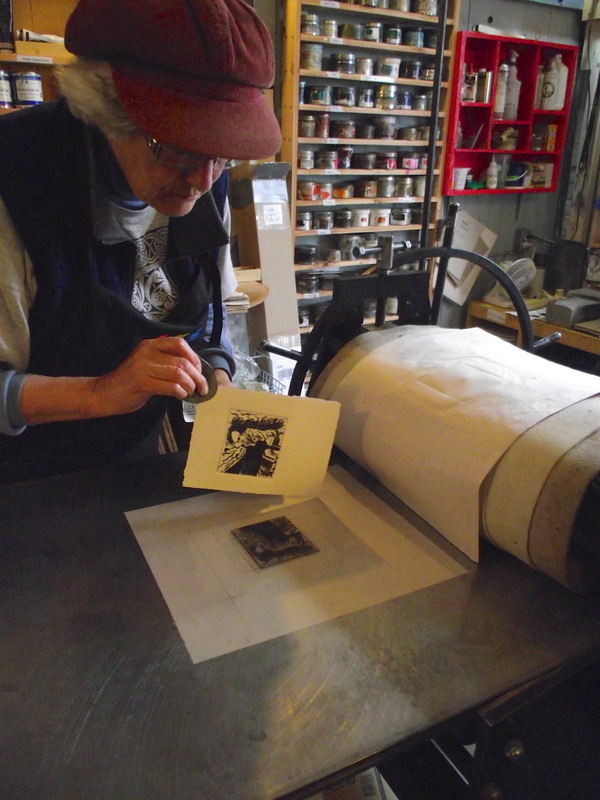 Recent new member Martime working on stencil monoprints. 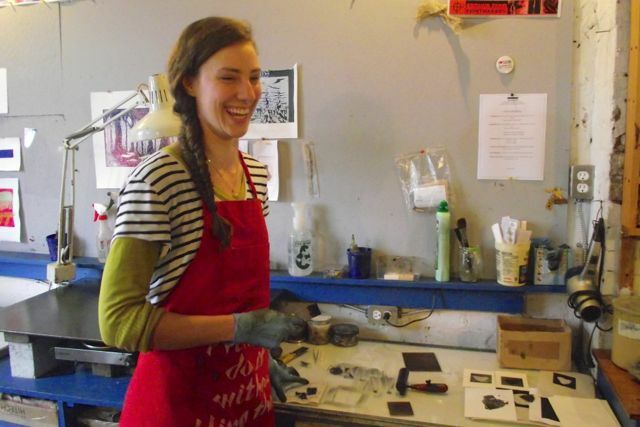 Artist Desiree deRuiter printing edition for Kamloops print exchange. Paper size should be 20" x 26", with option of image fitting on 18 x 18 cm (3.9" x3.9") paper for Cadaques (if you would like the option). Exact plate size to be determined.